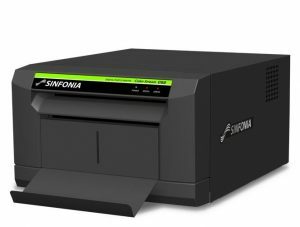 The Sinfonia Photo Card and Hashtag Printer provides superior image quality without smear by utilizing an unique thermal control technology. It is one of the world’s smallest and lightest photo printers, while still maintaining excellent print quality, durability, and fast print speed! 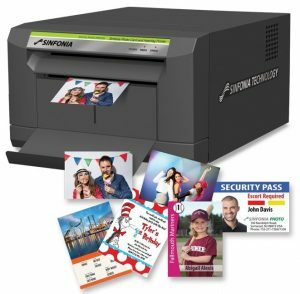 The compact design enables you to use this printer for theme park photos, security passes, sports trading cards, tickets, social media prints. The printer will produce prints 3 1/2″ x 2 1/8″ to 2 1/3″ card sized prints, perfect for private party, special and corporate event applications. Designed for portability, the Sinfonia Photo Card and Hashtag Printer is compact and lightweight. Measuring 11″ wide, 13″ in depth and 7″ in height, the printer weighs in at only 22 lbs. Perfect for mobile events or photo booths. Paper Sending Size Variables 3.5"x2.17", 2.20", 2.28", 2.32", 2.36"